This is delicious hot, warm or at room temperature. The crispy bread crumbs are key as is the splash of vinegar at the end. You want to use a squash that keeps its shape when cooked, like butternut, delicata, sweet meat or hubbard varieties. This could almost stand in for stuffing at a Thanksgiving table. It’s savory and comforting but not at all heavy. Heat 3 tablespoons oil in the largest skillet you have over medium-high heat, ideally an 11-12 inch pan. You need a large surface to brown the squash in more or less one layer. Do it in two pans if you don’t have a large enough one. Add the onion, thyme and chili flakes and cook, stirring often, for about 5 minutes until softened. Add the diced squash and 1/2 teaspoon salt and stir well to coat the squash evenly with oil. Cook over high heat for a few minutes undisturbed to start the browning. Toss, turn down to medium high and cover, stirring every a few minutes to ensure even browning. When the squash is just tender scoot it to one side of the pan and add the final tablespoon of oil to the open space in the pan. 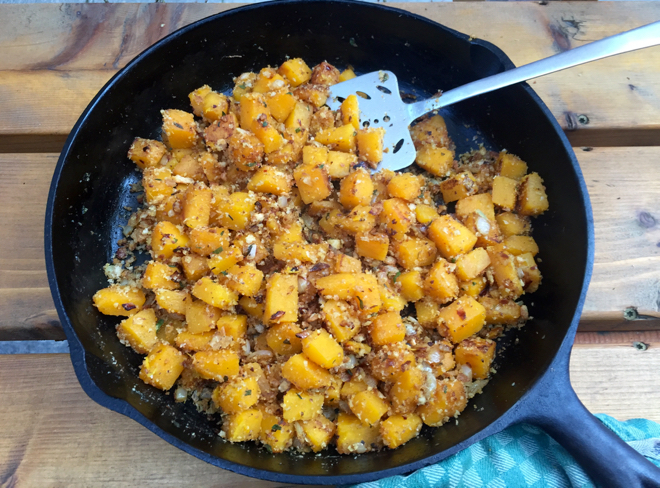 Add the breadcrumbs and let toast for a minute or two before stirring into the squash. Cook for another minute or so then drizzle over the vinegar and taste and adjust seasoning with salt and/or more vinegar if needed.